The latest album offering from those perennial Celtic rockers The Dolmen, entitled Whispering Winds is, in many ways, a journey back to their early folk roots with ten of the fourteen tracks being ‘traditional’ songs. As with everything this band does, it is professional and served up with a rare passion and energy which flies in the face of those who say that The Dolmen aren’t ‘folky enough’ to play major folk music festivals. The simple truth is: this band of talented Raggle Taggle Gypsies can be what ever they choose to be at any given time. Folk, rock, heavy, they can do it all and very often do within one single performance. They do traditional fare very well indeed as is evident with this album. The mix between Taloch Jameson’s sometimes pain-cracked and authentic voice and that of the two girls in the band, Kayleigh and Keri, with their stunning vocal range, makes this album one to truly savour. It is front-man Taloch who starts the proceedings off with two traditional songs, the Scottish, ‘Mairi’s Wedding’ and the little known English folk song ‘Lark in the Morning’. Both are pumped full of typically infectious Dolmen energy. This is followed by a Taloch Jameson composition called ‘Guide Me’, which is beautifully sung in the unique voice of bassist Kayleigh Marchant. One which is very familiar to the hordes of Dolmen fans who flock to their concerts and wildly applaud every rendition she does of it. The next song, ‘Albion’ is quite simply an Anthem from start to finish, a masterpiece in song writing. Once again a Jameson composition and once again beautifully sung by Kayleigh and ably backed up by flautist and vocalist Keri Pinney. It is essentially a love song to the sacred land that bore us and, with all the stuff in the news of late about searching for a new national Anthem, well, look no further for it is here and it is wonderful to our ears ! I can well imagine the two Dolmen girls belting this one out on the ‘hallowed turf’ before the FA Cup Final! The next two tracks are the old Scottish classics, ‘Wild Mountain Thyme’ and ‘Loch Lomond’, exquisitely sung by Taloch and showing off his versatile vocal to excellent effect. After this is a haunting traditional song sung by Keri in the Welsh tongue, ‘Suo Gan’. It is a song which Taloch’s mother used to sing to them as children and which her Granddaughter, Keri, does to perfection with her faultless vocal to not a dry eye in the house. This is followed by the other side of the Jameson coin, ‘The Drunken Pirate’, a Dolmenised version of ‘Drunken Sailor’ and it does exactly what it says on the label. It’s a raucous rendition full of feverish Dolmen energy. Then we are back to the sublime once more with what I think is the quintessential version of the Irish classic, ‘Danny Boy’. Taloch’s vocal is simply amazing as he effortlessly lays this one upon you and once again, the sentiment in the lyric will have you reaching for a tissue to dry your eyes. The next choice is a bit of a surprise. ‘The Gaoler’ was on their last album but this live version is raw and with Josh Elliott’s masterful guitar breaks makes it breathtakingly brilliant. Then we are back with tradition and another live track, Dorset tradition and a song made famous by Led Zeppelin no less, but which The Dolmen have made entirely their own, ‘Gallows Tree’. Anyone who has ever been to a wild Dolmen gig will need no introduction to this one and, I dare you to not tap your feet. It’s just not possible! The next song by contrast, is just wonderfully laid back. Again penned by Jameson, ‘Eternally’ is another of his songs which will definitely stand the test of time in much the same way that Fisherman’s Song and Dark Skies have. It is sung by both Keri and Kayleigh. Then it’s back with the Irish and the Dolmenised mayhem of ‘Whiskey In The Jar’! Recorded live earlier this year is another tried and tested live Dolmen classic done with all the energy conjured from their stage performances. The final track can also claim that honour, though it is a far more recent addition to their live set, ‘Rocky Road To Dublin’. This one too bounces along to Taloch’s splendid feverish, tongue-twisting vocal and Keri’s flute mixed with Josh Elliott’s stunning guitar work make this one as memorable as any on the album. All of the songs here are played to perfection and we must not ever forget Kayleigh’s driving bass and Chris ‘Spankie’ Jones’ awesome tribal drumming which bring so much to the Dolmen sound. So, all in all, ‘Whispering Winds’ is yet another Dolmen triumph in CD form borrowing as it does from all four corners of these islands: England, Scotland, Ireland and Wales. Then given the unique Dolmen treatment… Dolmenising the old Celtic/Gaelic sound. 2011 witnessed the birth of Dolmen music in Holland and European countries with the ‘Storm’ tour, and 2012 promises their return with many festivals presently being booked. All of the traditional songs from the album except for ‘Suo Gan’ (Keri) were arranged by Taloch and Josh who were clearly born to perform music together and the whole musical ensemble is vibrant, poignant and just out of this world. 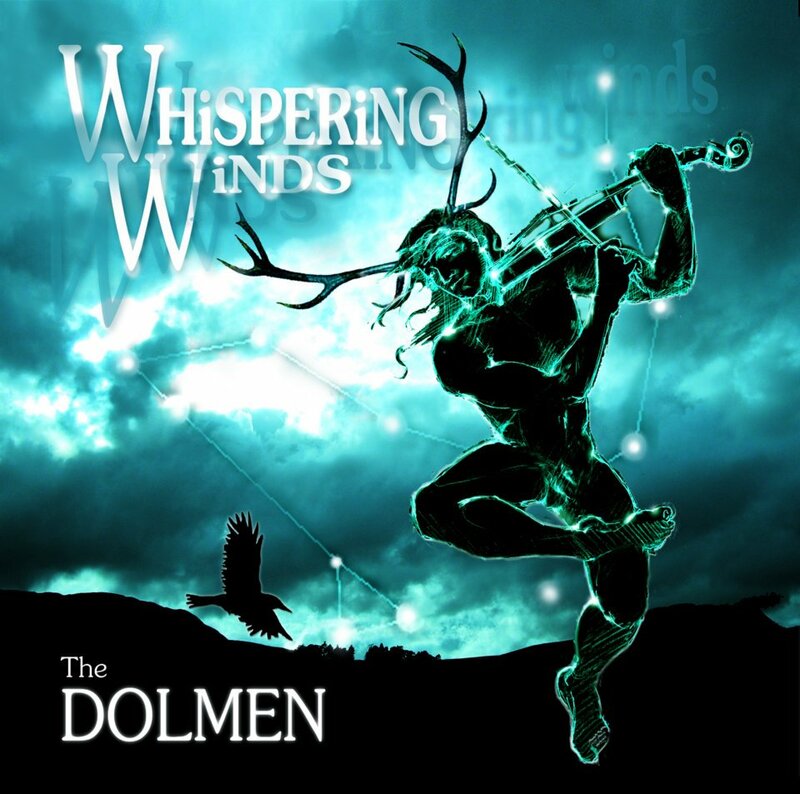 The Dolmen are a Weymouth, Dorset based folk-rock band that incorporate elements of Celtic, folk, pagan-themed, and historically based musical works into their largely original repertoire. As of 2011, group members are singer and songwriter founder/member Taloch Jameson flautist and vocalist Keri Pinney, guitarist/singer-songwriter/lyricist Josh Elliott, bassist and vocalist Kayleigh Marchant, and drummer Chris ‘Spankie’ Jones. The album can be bought through the website: www.thedolmen.com.